Anyway, he talked about the divergence of technologies, and I think it applies to the virtual monies they create as well. Yes, technologies diverge and diverge, branching out like he says, but then a lot of branches die off and only the strong survive. Only the most credible! And in the virtual money world, virtual money must be backed up by a credible company, that will back up your money, that will sell you a real stuffed animal (or whatever) for your points. And without physical backing of any kind, what can make it credible? Well, we already have virtual money. We have bank credits. And they are backed by certain institutions that are credible because they have the backing of being part of the Federal Reserve system, which has the backing of the Fed, which can legally print dollar bills. So credibility traces back down the tree to its originating branch of credibility. But today, the ultimate backing we have does not mean any thing of real value is exchanged at the source. Today, what makes institutions credible is how they go about DEFENDING the value of your virtual bucks. Because today, you cannot get anything from the institutions (like a stuffed animal or something), but you get stuff from everyone else who trusts and uses those bucks because the institution DEFENDS their usage value, their short term purchasing power stability! Now think of the Fed and the ECB as diverging branches, one of which will eventually die like the Game Cube. They each have their offspring of virtual currency circulating out there in neverneverland. And none of it is backed by the exchange of ANYTHING from the source. It is only backed by the DEFENSE OF USE VALUE at the source. The ECB has set up gold in its forex reserves. That means that it plans to use gold to DEFEND the value of a euro at some point. That's what forex reserves are for. The Fed uses other means to "defend" the dollar. The Fed actually prints MORE dollars to buy debt outright to force down interest rates to fantasy levels to make the dollar appear strong. So it debases the dollar outright in order to have some dollars to trick the barometer. That's how the Fed defends the dollar. The ECB will print money and buy more gold into the reserves if it wants to weaken the euro (raise the price of gold and debase the currency at the same time). And it will sell gold into the market if it wants to strengthen the euro (lower the price of gold and lower the money in circulation by taking some in). Of course gold will be at about 50,000 euros per ounce before this even starts. This is how "forex" gold reserves are much more powerful than the gold backing the dollar once had. They require less gold, they never run out, and they don't require the currency to compete in an unfair way with gold. And they can be managed at one central location yet their affect will be felt wherever virtual euros exist. Under the dollar's gold standard the Treasury had to restrict the entities that could come to the gold window. Under freegold, everyone in the world can come to the gold window! Everyone that uses your "virtual euros" has the confidence that you are DEFENDING their value against the most versatile real world physical trading thing; gold. And also that you are allowing gold to float freely, so that anywhere in the world, they will be able to buy physical gold with your euros. They are perfectly convertible at all times and places, because the ultimate institution backing them makes sure they are credible against gold, and that there will never be a physical shortage of gold priced in euros. That's the plan they came up with. And you can apply the credibility test to any competing virtual point system by tracing it back to the credibility of its ultimate defender. And that's my take on your video. 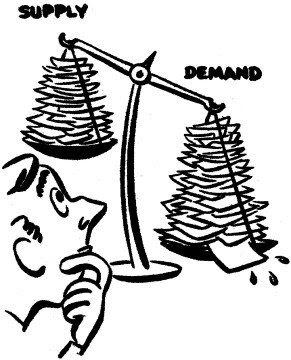 It is often repeated that our markets are driven by supply and demand. In fact, supply and demand is probably the most closely watched fundamental of the market callers. They look for various signals that demand is rising, or supply is falling. Perhaps they are thinking too hard in a very soft world. Or could it be the other way around? When we think about supply and demand, it is helpful to think of an ancient barter world, modern paper trading tends to muck it up a bit. So think about a supply of chickens at a Medieval fair. Let's say there are 10 chickens cooped up in a booth, with several buyers bidding for the chickens with their various goods. The first bidder take two chickens for the price of two bushels of apples. He hands over his apples and walks away with the two chickens. 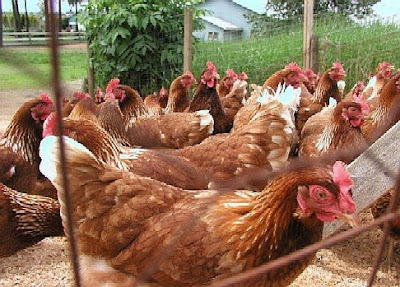 Now, the rest of the bidders are faced with the hard reality that there are only 8 chickens left where once there were 10. This is called "hard trading" and the bidders are able to form "hard opinions" about the real supply and demand in front of them. Next let's imagine that the first bidder only had to put up 5 apples as margin and then wait until the end of the fair to decide what he wanted to do with his purchase. How would this affect the rest of the bidding? Now the other bidders must make value assessments based on "soft opinions" relying on conjecture like "that first bidder rarely takes delivery of his chickens, he's just in it for the quick apple." This is soft trading. Soft trading tends to draw in a lot of bidders (traders) who are willing to put down a margin requirement in the hope of making a small profit at the end of the fair. The seller of the chickens may have 30 different buyers for his 10 chickens, each putting down 5 apples (or whatever their good is). 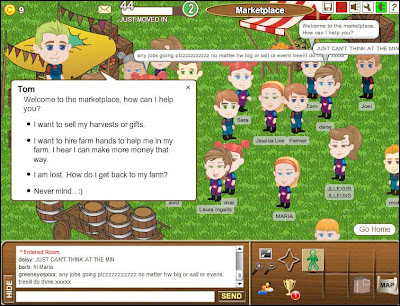 At the end of the day, 5 buyers will go home with two chickens each, 10 buyers will receive their 5 apples back plus 3 more apples in profit, 15 buyers will lose their 5 apples, and the seller will end up with 10 bushels plus an extra 45 apples while the "price" of chickens actually falls! This is because the seller, who had only 10 chickens to sell, flooded the market with 60 "paper chickens" driving the price down and at the same time making himself an extra profit. patience is easier to say, harder to perform. Now does THIS sound like the EU and Germany are fretting about whether the IMF will upstage them and "fracture the EU" or "destroy the Euro" OR does it sound like the EU/ECB is bending the dollar bloc countries over a chair. "Germany sets tough terms for EU help for Greece"
"Furthermore, it would be necessary for the International Monetary Fund to provide a substantial contribution," he said, stressing there will be no decision on actual aid at the summit. "The message from Berlin is crystal clear really, which is that Greece still needs to continue not just with consolidation but to test the markets out and if necessary use the IMF," said Julian Callow, Chief European Economist at Barclays Capital." FWIW if the IMF is at some future point deliberately frozen out of the EU and Asia in the performance of its (claimed?) mission of the last 50 or so years; does it lose its' raison d'etre? I can see the point in that, but wouldn't the IMFs involvement bring some requirements etc. that are less welcome? If so, I wonder what their horizon for the dollar's demise is. please explain the ref to oil and germany? I wasn't too concentrated yesterdaty. Köhlers remarks regarding oil prices were basically about tax increases. Higher taxes on gasoline is not something the population like, so his quote was mainly related to the political row with Merkel, not so much about A/FOA. The article basically comes down to the fact that Merkel is facing unwelcome opposition from Köhler in the heat of this moment. Do you guys believe that the IMF will die along with the dollar? Our dollar currency system has drifted far, far away from this expectation. Early on, years ago as we began printing more money than the goods we produced could be delivered (sell) against, prices began to rise (price inflation). But we adapted by expecting interest returns on these dollar holdings to make up the price rises. We accepted that if in general, American price inflation was running at say 5% then an 8% return would somewhat cover it. Over time and throughout our up and down price inflation cycles, we progressed further and further into accepting some form of ever increasing extra return on dollar savings as the balancing factor. Today, whether it's the stock market, bonds or whatever, dollar holders rely more and more on trading profits and derivatives to cover the added risk. In that sense building a housing bubble of perceived wealth and GDP growth could very well have been a deliberate attempt for stretching the dollar's life. Have they really run out of tricks this time? If gold where to be traded primarily in Euro's (which after all seems to be what A/FOA were predicting) would that still happen in London, or would it move to a European location? US demand is shifting from China to Japan. They still seem willing to recycle dollars. I still say the IMF wants to be in the bailout, not because they want a strong dollar, but because they want a weak dollar. Short $, the IMF says great! How many would you like? We print them infinitely. There is bound to be an IMF/EU split. The battle is for the world reserve currency, and for a reserve currency, weakness is strength. Having no gold backing gives IMF the clear advantage here. IMF can break the Euro politically, not economically. By bailing profligate countries they undermine the basis of EU economies, keep the zombies of Greece, Portugal, etc. from being reformed. Keep the weak countries under US control. Break the EU and you break the only real threat to USD hegemony. The EU thinks because their goal is only a stable currency the US is not their enemy. Big mistake! US cannot abide such a threat to the dollar. ...We can no longer cut off the strong dollar / growing deficit circle by raising rates and invoking a recession as in the past. This time we must continue to pump the reserves at all costs in a process that only floods the world with more dollars. There is a battle on, but in the end weakness will not be strength, but a weak dollar for now might somewhat postpone its real demise. I tend to share those feelings somewhat; the IMF might indeed bring some unwanted US influence to European affairs. I think the EU know full well about the position of the US and the reserve dollar. I don't believe that the Euro was not created by coincidence. IMF going for the win! I'm quite sure I do not yet fully understand the dynamics involved, but a weak Euro - meaning a strong USD - might be the thing that eventually kills the USD and hence not bad for the Eurozone. The quote above might be quite off. About the IMF involvement I remain unsure. I agree that a strong USD is the worst case for the US crowd, but it can always be overcome with the printing press, as it has been for decades. Short term USD strength is a small price to pay for influence over the rival Euro. That would depend on who is in the lead. I doubt it that the US has forced the IMF unto the Euro, but remain somewhat wondered as to why the Eurozone (might) let them in. Perhaps indeed to further short the buck (as it is likely to go down a lot in its end). Perhaps the tables have turned at the IMF and made it more pro European, although I have not funding for that. Perhaps the IMF if willing to facilitate the transition away from the $US. Thank you for this enjoyable discussion. I think FOFOA is right that a transactional fiat currency is easiest to use. But we already have that, it is the USD. You can save in gold, euro, anything you like. I want to save in the strongest possible currency whatever it is, gold, euro. But for transactions I want to buy the cheapest widely used currency. USD. If (when) USD fails, then bring back Ayn Rand. Gold standard! Is the euro not transactional? And has the gold standard not proven to always get broken when circumstances seem to demand it? We will see no gold standard again in our future. i think if the EU uses the gold revaluation, then the concept of the IMF breaking the EU politically would go against them. if the EU feel's its desperate and has no other options, it will revalue its gold not the way they would want it naturally but that would then destroy the USD and the IMF. Yes all fiat currencies are transactional but only one is the reserve currency. The ultimate transactional currency. I don't think the gold standard ever broke, but of course it was cheated. Perhaps it is impossible to create a monetary standard that is not cheated in the end. Gold is the closest history has come to a stable standard, and I would argue it is a stable standard, until it is cheated. Then it is no longer a gold standard? Mike, I think that is the nuclear option FOFOA discusses. But the EU wants the IMF involved, so they don't seem to feel threatened. Would you invite in the wolf at the door, and then go nuclear? As FOFOA and A/FOA indicated gold is likely to become a wealth asset, not a currency. In that sense it might become demonetized for the first time in history. Both the EU and the US btw will be best of with a gradual transition. The EU is not looking to blow up the dollar or the US, only to establish a currency that will remove them from the umbrella of the $IMFS. Their walking away from that umbrella will have its implications but those were never the primary goal. The world is not going back in time for a repeat of gold's historic money function. The future of gold is before us and that future holds it as an asset of great wealth, not a currency for everyday spending. Indeed, it will be more than money, perhaps a wealth beyond money! The dollar has overstretched itself. A dollar is basically a mortgage on the real world and people believe to be holding a part of the real world in there hand for each dollar at today's price levels. In reality more mortgages haven been written against the real world than people imagine, and when they all come to cash out their part will turn out to be much smaller then was perceived. Prices of things will rise to match the all the dollars people hold in their hand. The first step in this cashing out has been set by transferring perceived wealth from derivative instruments into real dollars by the Fed buying them up from banks. In time all those dollars will lay their claim on the real world. However, the dollar has been overstretched for well over a decade en yet we have witnessed no massive cashing against the real world. That is because such cashing would have destroyed the dollar, and as there was no alternative halted world trade. As that was in no-one's interest all worked together in keeping the dollar alive. Now that there is an alternative - the Euro - that dollar support might falter. That is why the creation of the Euro was so important. However, before it will be viewed as an alternative to the dollar, it will have to be seen as such. With the current troubles in the Eurozone one might doubt we that far already. Euro is in crash mode today. If they are going to defend it they had better do so soon, as there is open speculation now about parity with the USD and which countries will be thrown out of the EU. Your logic is mistaken. Why invite the wolf as you say to the door if as you insist or imply there are other options? Does the imf have the horespower for spain and italy and portugal? For california illinois new york. If you owned something real how long before you simply asked for payment in kind? Transactional implies backing but not explicitly. So talking about mutually exclusive roles just misses the point. As for ubs and the sell side listen at your peril. In other words useless. Events in the transition are way bigger than the day-to-day speculation from the financial commentators, so I would not cling to much value onto their judgment. I do however believe that in order for the transition ($US/EUR) to happen the Euro will have to be perceived a viable alternative. Many things (e.g. rising gold, an increase US trade deficit as a result from a strong dollar) could add to that, but I tend to believe we are not all the way there yet. Interesting: Gordon Brown has been ordered to release information before the general election about his controversial decision to sell Britain's gold reserves. Expectarions rising with every downtick in the euro. Germany is the world second largest exporter. They care a lot less than they screem about Greece. Check out this clip on youtube about Brown's bottom. Nice mention of the birth of the Euro and Greenspan's warning to Brown that Germany could only buy stuff for gold during WWII. forex traders are running to the dollar today, but debt holders are not showing up. another bad bond auction today. more bad news for the 7 year tomorrow? Is this a sell side analyst to be ignored? European Central Bank Executive Board member Lorenzo Bini Smaghi Wednesday starkly warned Eurozone leaders that they must agree on aid for Greece and not let the International Monetary Fund do the job for them. I would think that Bini Smaghi is quite relevant. I'm still unsure about the European strategy. Köhler as ex-IMF board member chasing Merkel does not sound too good to me. Perhaps Europe really is searching for an answer, after all they are various countries and factions. On the other hand perhaps their strategy is simply to delay events, thereby seemingly accidentally lowering the Euro. A lower Euro would halt US exports, thereby further stripping $US credibility in a somewhat longer run and worsening the domestic financial situation for the US. Plus lower Euro would mean higher gold price in EUR, and hence more attention for the metal. And as the US will again have to further lower the $US in order to stimulate exports etc. that would eventually mean a higher $US gold price as well. That might be one road to freegold. More Brown's bottom here and here, although most of us have probably read about it somewhere in the past already. IMHO, we won't - can't - get Freegold until the US Bond market goes belly-up. You mean until US bonds will loose their reserve status? Some sources argue that bonds are already being bought by the Fed in massive amounts. Perhaps Freegold can only come when the switch to the Euro as reserve is trusted (rising gold prices would add to that). Perhaps that's why all those $IMFS rating agencies are now primarily on the Eurozone countries. In the process of switching the US Bond market will probably end. I'm not sure what sequence of events to expect. As a Swiss citizen, I see the EU as being no better than the US Federal government. I was always against Switzerland joining the EU, and I have witnessed many left wing Swiss politicians attempt to drag Switzerland into the EU against their voters' will. As an American Citizen I have also witnessed the slow destruction of our constitutional rights through the ever growing federal bureaucracy. I am mentioning this because it illustrates the cost of surrendering sovereignty to larger state entities. The EU to a certain degree "stole" Greece out of the US orbit, and the price was the shelter of the Euro and the low interest rates it offered. All of Eastern Europe was looking for the same bargain. In effect they turned their back on the US and its hyper-power protected dollar that had shielded them for 50 years, and opted for the Euro-room. IMO we are seeing the first real threat to the $IMFS since WWII and possibly WWI. As FOFOA alluded to, currency wars seem to be inevitable, and the last two times the Anglo-American banking alliance fought the continental Europeans the results were catastrophic. I think that a currency war will be like a series of bank runs. As each more vulnerable bank folds, the money flows to those that are better capitalized and thus bolster their balance sheets. It will be the same as each sovereign currency fails, and all that will matter will be to be the last currency standing. Sure, right now being weak doesn't carry a premium, but once the sovereign countries (and US States) start defaulting it will be a competition between which currency that is the least-ugly, not which one is the prettiest. In the process you mentioned gold is almost guaranteed to rise. And that just might make the EUR get out on top. After all it's braced for rising gold prices. imo, gold traders (long or short) trade most of their paper gold on leverage. this is why you see so much volatility. anytime you see panic's like this, we see every paper asset being sold so they can pay back their leverage bets in dollars. gold is treated as commodity in these cases because if those traders treated it as a real safe haven they wouldn't be trading the paper gold markets. so how do we make gold become a real safe haven to these traders? the exchange goes bust by not being able to deliver the metal (unlikely) or the BIS changes the gold market, shut down the exchanges, mining shares etc.. and revalue gold. or price oil for gold. this only when the chosen CB's are ready. defaults can't start happening, maybe a few small countries here and there but anymore and they will loose control. An international bank has branches across all the capitals and large cities in the world. This bank offers a gold ETF redeemable in small volumes in gold in all branches. Each branch will also accept gold deposits. This ETF is denominated in gold weight and also current rates for any currency and can be redeemed in any currency of the customers choice in a sliding but reasonable transaction fee scale. In Switzerland we are getting close to this. ZKB offers gold redeemable ETF's in multiple currencies. But each ETF is denominated in one specific currency and you have to sell and buy to move between the denomination of the fund, and they are only redeemable in Switzerland. There are some good comments by "Civil-Disobedience" here. Just give the page a few seconds to load and then search for FOFOA to find the first comment. Is one of you guys Civil? Also a discussion about the gold disks happening here. Mike, it was not too long ago that I posted some Topaz quotes about the dollar soaring to USDX 100+ and gold (paper gold) plunging into the hundreds, and how this would signal the end. Gold into the hundreds will crush a lot of goldbugs playing the game. ANOTHER always said these people would get crushed. That only the physical holders would realize their value. And then he always ended with "Time will prove all things". I believe it was also said that the shorts would reap the biggest fiat profits in the end. The only question seems to be when is the end? this goes back to what i said a few weeks ago. 4. the last push for physical gold from citizens through jewelery refining. this will be a dead industry soon. you will find that gold will be replaced with another metal for jewelery when its no longer available. what do these US banks know about the future of physical gold and paper gold? the kingpins of those banks all have physical gold rest assure. the usd going to 100+ will signal the end of the reserve currency status. some eu countries will go down under in this scenario and even others ie dubai world. central/south america possibly too. this is when desperate measures will come to play for the rest of the CB's and the rest of the world will break the $imfs. perhaps this is when gold gets revalued and shut down to stop further derivative blow ups. if gold gets revalued to several thousands and held in reserves, suddenly those toxic derivatives dont look too bad to the CB's when they are minor portion of its assets. If you are reading this, email me. I have something to share with you privately. Thanks for the Brown's Bottom links! Esp. the Telegraph and Jesse. We may not have freegold yet, but the rising price of gold over the past decade is revealing ugly truths that were previously hidden. Remember Another said, "Westerners should not be too upset with the CBs actions, they are buying you time!" Of course that was written two years before Brown started selling. It seems likely the public may not be as forgiving as Another. "Mr Brown and the Treasury have repeatedly refused to disclose information about the gold sale amid allegations that warnings were ignored." Well, by now everyone must be aware of the "open management" of the gold price. "Another" had been bringing this picture to light long ago. In puzzle form, he offered ideas, Thoughts and directions for consideration. Only a short time ago most analysts completely wrote off such "thinking" as being absolutely "on the fringe of reality"! Today, the "absolute fact" is that gold is used and managed as a "world currency" of major importance. After the BOE announcement on Friday, currency traders are grasping the concept that gold is, as never before "at the center of reality"! Many different factions are maneuvering gold these days, and each has their own agenda. The IMF / dollar faction, many years ago, went along with Europe in lowering the gold price in dollar terms. It made the dollar look stable and enforced its continued use as the "currency of settlement" for strategic commodities. Any country running a balance of trade surplus of dollars, was free to buy gold at a stable to lower price, and partially replace the paper dollar reserves. Because the dollar is the "world reserve currency" many countries ran dollar surpluses with trading partners outside of the US. In this light we can see how the integrity of the dollar was expanded, even in countries of nonnative dollar origin! Not only was physical gold purchased, but paper gold with distant CB backing was also accepted. Ever wonder how all of this gold was placed? You see, over the last many years, there has been a quiet boom going on in gold ownership. The sheer number of world gold buyers has more than doubled, along with the amount of gold owned! The problem is that the amount of physical gold in existence has not doubled, only the warehouse receipts. Most of it never, ever left the vaults, as the true placement was done in receipt form. Yes, slowly, over the years, even major private bullion holders offered up their physical for "convoluted, future delivered, leased and released gold". Much of what is now held is little more than a form of gold options for "future deposit". Not unlike the "cash dollar that is supposed to be in your bank", but really isn't? As the bank only holds your deposit as a "credit" to your account, so is much of the world traded gold "only a credit of account"! This all leaves us in the present political situation, where the IMF entity, that was formed to replace the gold standard, is now trying to back the present paper gold with physical to prevent a run on the dollar. It is a futile effort as the ECB / BIS have grown the gold market into massive proportions by encouraging the many year expansion of holders through paper securities. All denominated, ultimately, in dollars. We will see $10,000 gold, count on it! It's the only way this can be resolved. That same figure will create massive backing for the Euro and hasten its journey into world reserve currency status. Expect most of the ECB liability for gold to be easily converted into Euros at the dollars expense. "Do you guys believe that the IMF will die along with the dollar?" Sorry I am late to this excellent discussion. Couldn't resist responding to your earlier question. The US$ is the biggest part of the SDR basket. It follows that its fate is tied to the fate of the US$. The IMF is dominated by the Anglo-American PTB. When US$ = ex-reserve hegemon + ex-oil currency then it follows that the IMF either needs a new patron or it becomes irrelevant. IMO irrelevancy (= kaput) is the most likely outcome. To whom did Gordon Brown sell the gold? I doubt anyone here could tell you who came into possession of the gold or even if it actually left the Bank of England vault. Officially it was "sold" into the open market. Translation: If I understand the process correctly in order to cash out China simply needs to present the UST paper on expiry of the term rather than roll the debt over. "As The Fed Runs Out Of Low-Rate Options, The UST Is Likely Considering An Orchestrated Move Of Risky Asset Into Bills"
Today, gold is worth far more than its traded contract price,,,, and has been for some years. That's the reason some players have owned it while giving up any interest and stock gains they could have enjoyed. Listen to this and listen closely: "the real value of gold today is based squarely on the probability of whether the US dollar can survive as a reserve currency"! Now, would you sell your gold into the BIS system for dollars,,,,,, at the market price today to have it returned in Euro gold credits reserves at the real price much later? the IMF gold leaves at one price and returns at "Another" ,,,,,,,, it travels far but never moves,,,,, while the BIS holds the value for a later use in time. It seems a neat "gray concept" to have just popped out of nowhere, no? Was that plan already "in process" somewhere ,,,,,, someplace,,,,,,,, think about it? Then think about the dollar price of gold today? In fact, "think long and hard about it"? England was not only part of the dollar faction, it was the dollar faction and is clearly becoming a "runaway" nation. They are moving towards the Euro and leaving our dollar world. But, unlike many other first tier Euroland nations that joined and quietly sold gold into private accounts, Britain is selling its gold in an obvious "retreating action" from the dollar. Truly, their government has a long history with the "who's who" in LBMA and I suspect owes more than a few favors. Their little gold sales are specifically designed to allow some "backing out" room before the dollar based contract gold markets fail. Once in the Euro, England will enjoy the shelter of a free gold market that supports the Euro system. Still, after saying this, I would not be surprised to find that a good portion of those bullion bars ended up filling contracts owed to BIS accounts. Nice quote, I don't recall having read it before. Brown's bottom if en when in the open is highly likely to (massively) impact the gold market as it is likely to reveal part of the games played. Off course they do not want to disclose and I doubt it will happen. They could off course try to fabricate something the coming month, loose the papers or find some other exit. We'll see. As for the FOA quote: That is what America found when they tried to auction its gold in 1978. The Euro carries no such baggage. A mentioned that oil found out that they couldn't openly bid for gold in the late 70s. He must have been referring to the same event. What is your perspective on that? Their little gold sales are specifically designed to allow some "backing out" room before the dollar based contract gold markets fail. Once in the Euro, England will enjoy the shelter of a free gold market that supports the Euro system. I have been reading the same part yesterday and thought it an option that Brown (the UK) secretly bought into the EUR. The IMF might indeed simply become irrelevant. As for China and the US - did you read that Japan recently became the world's largest exporter to the US? Might just have something to do with them buying more US treasuries and hence still being willing to recycle $US. The guy in the Max Keiser vid did say that Greenspan warned Brown with a quote on Germany (5:40). He also mentions that 40% of the proceeds of the sale went into euro-denominated assets (5:00 min). "He must have been referring to the same event. What is your perspective on that?" No, those are opposite dynamics! Even the French knew in 1968 that gold was worth more than the $35 US dollars it was being sold at from the US Treasury. That is exactly why they wanted to swap out all their dollars. For the same reason we are buying gold today! And then when the Treasury opened its vault in the late 70's it found it had plenty of takers, even at market prices which were much higher than the book value of US gold. When trade deficit countries' CBs open their vault it is a chance for the surplus nations to balance things out. Price doesn't matter in these cases. It is simply a currency exchange at whatever the price is. The US hoarding its gold after 1971 was a real cheat on the global trade balance. If you are a trade surplus country, you can't just go buy up all the real estate and corporations in your trading partner's land. They won't allow it. You need gold to flow freely so that trade can be balanced. Paper debt just doesn't cut it forever. So if the US ever opened its vaults at market prices, it would have a swarm of surplus dollars ready to buy any amount (or all of it!) at the market price... WHATEVER THAT PRICE IS. These same entities will not bid for the same amount of gold openly in the market that they would gladly take from the US vaults. This was the lesson learned in the price spike of the late 70's. When a sovereign gold vault opens its doors it is different than bidding for gold in the marketplace. This is why Ft. Knox has been locked since the 70's. And why we had the WAG. I had the impression that both both Oil and Washington "learned" about the relevance of gold in '78 and that both A and FOA were referring to those auctions. America found out that there was great demand for the gold, Oil learned that bidding outright increased the attention for gold and made it money again. Did you mean to say that A and FOA were talking about two different events occuring in the late 70s? "One thing you don't do is buy gold outright," is different than buying from a Treasury auction. He was talking about the effects of a sovereign bidding on the open market. Honestly, during most of our investing "timeline", we as Westerners have never understood that owning [physical] gold itself "IS" the profit one makes when a reserve currency system fails! The price of physical gold in said failing currency is "meaningless" because that price can no longer express any long term value! They (paper gold bugs) "now" rightly warn everyone that this "political control" of gold is coming to a dangerous end and council investors to "be in" the gold markets for this ride. But most "gold bug traders" stick to "the paper facts" and maintain strict "paper trading" discipline. [technical analysis] I submit they will completely miss the "real profit" of owning [physical] gold at an advantageous currency price. Their trading with factual information about this "paper marketplace" will eventually net them only more paper gold or currency in a cash settlement. Both of which values will fall completely behind a soaring physical market. By sticking to the "facts" dictated to them from trading in a hyper inflated paper contract market, they cannot see the "reality" of a coming "politically induced" shortage of deliverable gold. Just because a contract is governed by the Crown's laws, doesn't mean it will retain the value of physical settlement. As the dollar holders prior to 1971 thought they held a receipt for warehouse gold, the dollar's gold market today will leave traders completely out of the greatest gold bull ever to occur! This my friends is understanding the politics of gold in its fullest context. Could "outright" not mean buying openly from a treasury auction, for all to see? I do understand the difference (regarding balancing trade between countries) anyway, thanks for that explanation! Since 1933 there has been a thin membrane that separates sovereign entities (SE) from private entities (PE) when it comes to gold transfers. Gold moves from PE > PE as a commodity. And it moves from deficit running sovereign entities (SE-D) to surplus running sovereign entities (SE-S) as a monetary asset; a balancing function in the monetary system. SE are different than PE because they can print money, and they collect foreign currency surpluses. Whenever gold starts to pass through that membrane, no matter in which direction, a phase transition starts to occur. If a SE-S tries to buy gold from the PEs, gold starts to phase-shift from a commodity into a monetary asset. If a SE-D tries to sell gold to the PEs for the foolhardy scam of lowering its commodity value, gold starts to phase-shift to a monetary asset because it is clear what SE-D is doing (especially to SE-S). Freegold will be the elimination of the membrane. All players will be on a level playing field. This is not a gold standard. But it is a shared function for gold between SE and PE. By the way, think about $6,000 gold trading amongst the giants with this membrane in mind. Well explained. Thanks a lot FOFOA! Btw I ran into a speech from Trichet (in French) from 2008 the other day. Funny how understanding the architecture of the euro can transform empty talk to something quite meaningful. E.g: Les Européens ont entrepris de réaliser ce qui était considéré comme impossible, ce qui n’avait encore jamais été tenté au cours de l’Histoire. Tocqueville a dit : « L’Histoire est une galerie de tableaux dans laquelle il y a peu d’originaux et beaucoup de copies ». the Euro is something that truly never happend before in history. As Toqueville said: "history is a galary of painting in which there are many copies and only a few originals". I think that can only refer to freegold. ...Il est peu douteux, dans ce monde profondément renouvelé, que les européens considèrent leur Union économique et monétaire comme encore plus justifiée qu’au moment de sa création et la pensée des pères fondateurs encore plus visionnaire. ...There is little doubt that in that new world the creation of the Euro will be regarded even more justified and visionary than it was at its very start. More speeches to be found, also from Duisenberg. Didn't look at them yet. I did read Merkel, but it's only about political issues, not about monetary aspects. "As for China and the US - did you read that Japan recently became the world's largest exporter to the US? It might also have something to do with the fact that if you are No. 1 in a race all you have to do to become No. 2 is to slow down and let the guy/gal behind you get in front. I wonder; Does China want to "win" this particular race anymore? "Even the French knew in 1968 that gold was worth more than the $35 US dollars it was being sold at from the US Treasury." As per the Coinlink article and source material; even as the US gold for oil deal in 1945-47 was being played out at US$35 per oz the gold bullion discs were being sold for US$70 per oz in India. An old story has become new yet again, perhaps? Yep, that is true. I think we sort of see it the same. China has become less willing to recycle the dollars, while Japan still does. Hence the takeover in position. Your explanation of the membrane is quite good indeed, thanks again. Gold does trade in different roles depending on the entities involved in the trade. Just to clear my point on the world "outright" here is another quote from FOA: Besides being big buyers of CB gold sold outright, they were also buying some of the borrowed gold. Perhaps that membrane was rediscovered in '78? So, did Brown buy the UK into the Euro? Some clues presented above could indicate so. Also this (from FOA): LeSin's post today (# 47852) about someone noting a BIS offer to take England's gold is to the point. (Hi LeSin, how is your French Sorrel growing? (smile)) That was the last offer before a changed position. They would not do it today. Look at your charts and see where this market the time where gold was finally allowed to drop below $280. It is indeed strange that it hasn't fallen much further. Where once they stood ready to buy gold outright, in order to stop the wholesale reproduction of contract gold from driving the traded price too low, and degrading the very asset that gave oil producers reason to support the dollar,,,,,,, the market itself would now be allowed to kill itself. All so the final gold contracts could be delivered. That process was evident in the Washington Agreement and the years it would take to complete that workout..
Was that the goal? Did it need showing that their was sufficient demand at that price? More FOA: Yet, this gold is a major part of the Euro system of the future as it will be a replacement asset for nation states that stand outside the Zone but will trade within it. (as a contrast to Britain that will join). One more danger for the Euro could be that the German gold might be located in the US. If so, the US could sell it of basically undermining the euro, although I doubt that scenario. Of course my thoughts are from a market perspective, and not from a NWO "oh noes, they is gonna control us and enslave us fohevah" perspective. Funny how emotions so often seem to be inversely related to understanding. The more one sees things as they are, the more emotions evaporate. Perhaps understanding does not go with opinion. After understanding we could off course still wish for things to be different, but we can also accept why they've come to be as they are. we noted that the paper gold game was reaching it's limits. The BOE was almost asking "what do you want us to do"? The answer came as plain as day as the paper price was driven a little lower in return for a gold sale reduction. Yes, clear as a mountain stream,,,, the unwinding has begun! It will continue until the big event when the gold rules are officially changed. Everyone that is expecting some huge paper short covering rally has got to ask themselves one question; "do ya feel lucky"? (smile) It's important to consider this because today's paper gold contract market is in the same credibility position as the dollar in 71. There is simply no way the Bullion Banking markets are going to allow our current marketplace to adjust to this mismatch by marking "This New (paper) Gold Market" to market against any true "delivered" physical gold value. Forget it! It's never going to happen during the dollar reserve era. Could be interesting... It seems as though FOA did not expect the (paper) gold market to rise the way it did while remaining intact. Wonder if he did see Brown's bottom right. I tend to believe that he believed the UK to have somehow bought into the EUR with that sale. Finally on the euroland/IMF question I would not rule out that Merkel (perhaps by indirect pressure van former IMF-boss Köhler) is indeed about to make a mistake. Someone offered that the fact that she studied physics implied that she understands gold, but I doubt that. Lorenzo Bini Smaghi did argue that bringing in the IMF would create the perception that the EUR could not stand on it's own feet. I do believe that a transition away from the dollar would only be fully agreed if the parties involved trusted the EUR. If they trust the IMF bringing it in might help, but the contrary is also quite conceivable I believe. This does not address the advantage of having a low EUR vs USD, which could be a primary target and outweigh most other matters. But I do wonder if Bini Smaghi would have spoken out in that case. "It seems as though FOA did not expect the (paper) gold market to rise the way it did while remaining intact." That's what I've been thinking. I think the paper Gold market will only survive till the US Bond market does (or vice versa?). Thank you Friend Of Friends Of Australians, there's a sofa in this country, with your name on it, any time you need it. BTW This simpleton finally gets it. 1. Physical cash to defend (spend first) your PMs over and above your basic needs in a local, legal tender world. 2. If necessary, spend your silver to defend your gold. 3. In an absolute extreme, spend your gold. I have a huge cash position, hedging my PMs. Actually, my (larger) cash position is standing guard over my PMs. It exists for that purpose, and for that purpose only. The PMs are absolutely positively what I am going to need on the other side of this. The cash ensures that I keep the PMs until then. see i just found out what PM means, precious metals. so now you hedge your PMs with guards. come on sw just talk plain. i am serious. i want to learn. i have lost, and i am not kidding probably a million dollars in this racket. i still have some major bouquet cash left. SWR i have always had my money outsourced and managed. until a friend said all they are doing is buying their buddies stocks. financials. so i am orphaned. I expect the currency to blow up, but I expect first there will be a period, perhaps a protracted period, of deflation. In deflation, cash is king. A deep and persistent deflation will cost many people their jobs, or at least substantially diminish their incomes, forcing them to tap savings to stay alive (food, rent/mortgage, etc). The purpose of my cash position is to prevent my having to liquidate my PM position in order to eat. I believe with certainty that it is the PMs that I will ultimately need, and I need to be able to hang on to them through the deflationary bust. Thus, I say that my cash position is standing guard over my PMs. This of course is just one man's theory. ... But the theory of one man who has been one of the most measured and reasonable voices on the two ZH sites for about 15 months now. Velobabe i believe he means he is keeping enuf cash on hand so as not to do what i am having to do. Turning silver back into cash for day to day money. A ten ounce bar of silver in hand feel like a good days pay! I like the solidity of it. Knowing it has value on its own merits, rather than the government check which will bounce sooner or later. Every time the ECB doesn't "blink", ANOTHER economic nation block looks closer at the EuroZone as the backing economy for a new reserve currency. Letting the IMF in could be regarded as "blinking", although their might be other factors involved off course. Perhaps... but it would seem somewhat strange to see the bond market fail before the gold market does as long as QE is an option. In this day, at end of dollar era, all do see real bullion sold for sake of market credibility, only. Perhaps too, bank credibility, I think. In this world, the lower this dollar paper price, the more bullion becomes available for credibility sake. Perhaps the banks indeed are in danger and required to take some more precautions in order to survive..
(Funny grammar, and hardly any articles used. The most people having difficulty with or not using articles at all I've met were from the Middle-East/Arabic). The reason this full transition has not already occurred is that institutional interest still exists to foster the smoothest practicable transition until that unknowable moment where the final remaining *SNAP* in the adjustment occurs. Only who are involved, and what is seen as smooth? I may be treading a well worn path here I know. What if the grand strategy of the eurozone and ecb differ? The eurozone is a political entity with italians and spanish the loudest in their calls for intervention. Substitute gov schwartzenhagger and gov patterson or coumo for the italians and germans. Peolsi or reid for that matter. The ecb may simply see the euro alone by virtue of its attributes as devoid of politics as fofoa and others have pointed out. What is more concerning is trichet extending the lower collateral requirements which is more important than greece in my view as it refutes the seperation argument I supposed. The ecb followed the fed into the gutter and such moves make those weary of seeing it as a carbon fed copy more and more nervous. Perhaps fofoa has an explanation as to why the ecb would allow garbage to be deposited at the door conceding that the it is already rumored that spain and italy and others have basically been kept afloat using this back door mechanism. Any thoughts on this? Revaluation of gold works both ways of course as the us could in theory play a paper game as such without ever openong the gates? What are the gating factors to this assuming the stated amount of 8000 tons? Also letting euro dominos fall is akin to bolstering the us banks by fostering massive capital holes in the euro banks. As someone said the us banks will use the fleeting fx advantage to consolidate up their position. Open season for us majors to gain share. Now the fed could alsways invoite in the likes of spainish banks like santandar to the us deposit game as some form of patronage? The key question is you can let that timeframe play out for obvious reasons if you are the eurozone worried about babk balance sheets etc and us encroachment. Therefore you either have a trump card? Maybe in derivatives market? Or Accept the status quo ex anti? What if the grand strategy of the eurozone and ecb differ? That does not sound unreasonable. I'm quite sure that only a small crowd (in which hardly any politicians I guess) know about the Euro in the sense that A/FOA/FOFOA (and we) do. What is more concerning is trichet extending the lower collateral requirements which is more important than greece in my view as it refutes the seperation argument I supposed. Correct. That by itself does not add to the trust in the Euro. However, exchange rates also matter, as A/FOA explained. A high (strong) dollar kills US exports thereby making the country and its dollar unbelievable. The larger the US trade deficit and debt, the lesser the trust in the $US. For the EUR its same way around. The lower the EUR, the more exports, the more trade volume in EUR, the lower the trade deficit (or higher the trade surplus) and the more reliable the country. And the higher the gold price (resulting in more attention for the metal). It is difficult to find what route they are taking, but I guess that behind the doors they do no quite worry so much about a falling EUR (against both the $US and gold) as one might think. The only thing at risk would be the political and financial integrity. "The lower the EUR, the more exports, the more trade volume in EUR, the lower the trade deficit (or higher the trade surplus) and the more reliable the country." Most people forget that a lower currency also means higher import costs (such as for oil), hence in the long run a weaker currency doesn not provide any benefit, although in the short run it may boost exports (but at a cost which has to be paid later in the form of higher prices and ravaging of savers) - kinda like a short term high you get from shooting (CB supplied) heroin but which also has long term health costs. Not a very good strategy IMHO. Each day that passes, the ECB disappoints me even more. "The reason this full transition has not already occurred is that institutional interest still exists to foster the smoothest..."
These "institutions" would have to be a very small minority IMHO, because if an institution knows about what's coming, they would first switch their own money IMMEDIATELY to physical Gold and then talk about feel-good things like "transition", "common good", etc. But as long as dollar strenghthens the dollar complex pushes gold down? The question theb becomes when does the ecb call out the us gold complex? When you look at the strategic positioning of the gold positioning the us has the geographic advantage in the americas in terms of production and majors no? Actually include aussie in the anglozone and you could declare monopoly? Oil is a commodity that is priced the same worldwide. Suppose a product consists of an oil component and a labor one: product = a*oil + b*labour. The oil component will cost the same in $US on the world market, while the added labor will be lower in the Eurozone. So for exports that doesn't matter. Domestic oil use will rise in price for the eurozone and hence create some inflation. That much physical is not available and by doing so they will blow up the paper market. This is for instance why China has been playing along for so long. But as long as dollar strenghthens the dollar complex pushes gold down? However, it does seem that the gold market is somewhat dying already. Mines are closing the hedge-books and CBs have stopped selling bullion. Only the IMF has some left. In the mean time attention for gold seems to be many times what is was ten years ago. The prestige of many international dollar holders took a real bath because they held dollars in place of gold. When they tried to initially bid for gold, the US and London made sure the price rose fast enough to tell a story to these dollar converters. That is; "bid for gold and it will soar" cutting off your conversion. Sure the US made all sorts of noise about how awful and incorrect the rising gold price was. Even showed their hand at managing the price a little so it didn't go up too fast. All the while saying they were fighting for all they were worth to keep it down! Truly, the last decade shows naive Gold Bugs just how much in control they were and are of this so called "free commodity market in gold". That leaves open the question of how much control there remains today. OMFG! Did any of you guys look at the ten-year yield/ US Long bond chart today ($USB)? Is it just me or do I see both of them about to crack long term trends - in the wrong direction (or the right direction as far as I am concerned). Looks like its about time the markets were crashed. If that doesn't get monet into UST's and the dollar keeps rising, say goodbye to the US Bond market. That would set events in motion. But is there no more QE? "while the added labor will be lower in the Eurozone." For a while, until the people realize that cost of "stuff" has risen and demand higher wages. Like I said, the effect is temporary. Debasing currency is no way to prosperity. "That much physical is not available and by doing so they will blow up the paper market." That's why I said there have to a very few institutions that know about this. For example large pension funds, all the investors in trillion dollar bond/stock markets, many third world governments even, etc. this is very reminiscent of the late 2007 period imho. The market keeps going up because hope is now the investment strategy though soon it will be discovered that hemloc is much smoother going down. In 2007 it was oh rate cuts will save ius it takes 6 months. Where are all those hacks. Then it was the accounting rule changes the short ban the wfc div raise. All fabricated myths sold to a complex desperate for a hit. Now we have the idea of normalized earnings and a premium multiple for then. Not to ignore qe. Read the comment about '78 slightly above. Even one entity might not get the gold it desires without blowing the market first. Hence better to wait and take only a little now. Also consider: Such demand be as 100 men with contract asking Spanish farmer for 100 basket of olives where clear examination in field display only 10 basket. Such good reasoning have these men, demand delivery and illusion of wealth to others be none! None ask full collection for fear of illusion to become reality, no? Perhaps, take what offered and wait next year. Better, sell claims for olives to Western investors with little eyes and clean shoes? Perhaps financial knowledge and sophistication of these paper sellers is more considerable than average fool. In the days that come, "better one olive in house than six blooms on tree"! One could wonder though what happens with oil prices if the Euro drops a bit and thereby makes the dollar less credible. Perhaps Oil will switch to the EUR and maintain a reasonable price for a while. And perhaps only a the little time it works for is enough. I do not yet have a clear perspective on this. As this happens the US will have to raise rates ever higher, even as it massively prints more currency to support our internal economy. Our entire economy will slow and fail as this price inflating process moves on. Some will call it stag / flation, but will change that description as the it becomes more of a crash / hyperinflation. Right now, the actions of our fed is telling this truth. We must inflate while we watch the Eurozone enjoy it's basically internal trade economy. As other nation blocks embrace that zone, they will pull economic function from us. ANOTHER implied as much when he stated that this was a way to get oil off the dollar without war. So would the US start a new war now? From my viewpoint, Germany is calling down hell on itself if the EU needs the IMF to settle these situations even if temporarily. Germany’s indecisiveness is debilitating and must be deliberate as it is too stupid to be stupid. Pedro has outlined an agenda yet it remains foolish for Germany in both the short and long term. The situation in the entire Western world is on tender hooks and any problem anywhere is everyone’s problem in the Western world everywhere. That is the product of globalism in the Western world. Quite similar to what we were thinking. "this is very reminiscent of the late 2007 period imho." Many commentators seem to think so, but remember that although history may rhymes, it doesn't necessarily repeat. This time an induced market crash may not save the bond market. Many "dollar deflationists" will commit suicide if this happens. Me thinks "dollar deflationists" about to get reamed. Yet, it’s all about Europe. Nothing to see here in the U.S. Looks like someone talking their short Euro book. Short Euro pushes up the U.S. Dollar Index which is 57% the Euro. This opens the dollar to COMEX gang. Has the dollar (DXY) begun it's final death rise? 82+ as of this moment. Weren't gold and the dollar supposed to rise in fashion in the end? If we are there yet, that is. If you advocate the Euro meme, you rest the argument on the ECB - Trichet's comments are not reassuring nor is his action on the collateral side. Furthermore, unless you espuse a return to a standard, and if you believe everyone is in the sinking boat (race to the bottom), the winner it would seem to me is he who inspires the most confidence. FOFOA seems to make the argument that gold is the differentiating factor for the Euro and that is its competitive (confidence) advantage. It just seems an unconvincing argument the more that trickles out from the Europeans. Wow. A lot of comments. I had a few thoughts along the way while reading. 1. For the giants, the big banks/bankers and the sovereigns, China!, it is not a practical goal to convert 100% (or even 90% or 80%) into gold even if they know freegold is coming without a doubt. For us shrimps on FOFOA "all in" is a clever option. But not for the giants. A 15% "hedge" in physical gold is pretty darn good for them. At 100x reset level, even China's (WGC-reported) 2% doubles its reserves. SE's never could go for full-stop conversion because there's just too much paper. China's reserves alone would take 40% of all the gold ever mined. Those few shrimps that went all in will be one in a million. 2. Europe supports the dollar's heroin habit. Always has. Europe has never even suggested the dollar should go into rehab. A/FOA always said Europe sold into the LBMA system to help the dollar (overdose itself). Seemingly incongruous moves could be excused if one assumes the ECB knows something we don't know. 3. The paper gold market (mine hedging, forward sales, gold leasing, futures, ETF's etc...) became (serendipitously?) a way for the SEs to "virtually" permeate the membrane without breaking it and causing a phase shift. This was a way to trick the PEs into settling the trade deficit with certain SE-Ss. It worked as long as the SE-Ss (large physical accumulators) were limited in number. And it always had a finite timeline when the expanding virtual gold would finally lose credibility. 4. Martijn, Did England secretly buy into the euro? Unlikely. That is one way to read FOA's cryptic words, but not the only way. 5. But is there no more QE? As Jim Sinclair says, there will be QE to infinity (at least in the US). On this, FOA and JS agree. I think we have a death rise, yes. As the USD increases in value, exports die off and employment worsens. Dollar too strong = problems, too weak = problems. It's a balancing game, but the treasury auctions prove no functional balance exists. Just an observation, but I find it disturbing how on the mark A/FOA were for their time. I apprecaite the accuracy, but it's unsettling to think someone saw with such accuracy so long ago. "Just an observation, but I find it disturbing how on the mark A/FOA were for their time. I apprecaite the accuracy, but it's unsettling to think someone saw with such accuracy so long ago." And 1997 was just when they started writing about it on teh internets. It follows that the inevitable conclusion was known by some very concerned non-dollar giants years (if not decades) earlier. This is why FOA often used the mountain-top analogy. The fractal landscape is much more clear from up on high. "Who are these people trying to kid? What is it that the Fed is scared to death of? The answer is a currency event called hyperinflation. This could be the real agenda in Germany to weaken the Euro to give the dollar a mirror image value which will prove illusionary. Clearly Germany’s on again, off again and now call on the IMF is a strategy to accomplish some agenda not immediately visible." Won't a high dollar kill it's bond market? Would you buy into bonds at a high cost while it's clear to see that the problems in the US are similar as the European states? ...while the BIS holds the value for a later use in time. In fact, "think long and hard about it"
Philip Manduca, Head of Investment of the ECU Group: "The only hope for the Eurozone, and the Euro as a currency, is that someone takes the spotlight soon, and that may be the United States"
He also says that the only way to avoid paper burning is to own gold. The article states Duisenberg (the Netherlands) sold 300.000 kilo for 6,4 billion in terms just prior to his leave for his ECB position. He did it in term in order for the sales not to be immediately shown in the books of the Dutch CB. The sales were done significantly above the rock bottom prices from the past. Seems to fit the description quite well. We know Duisenberg was fully informed about the Euro as he left to the ECB directly after the sale. Besides he had sold 400 tonnes before; he sure knew what he was doing and why. Btw that 6.4 billion price was in guilders; it's about 3 billion in EUR, for 300,000 kilo. Including gold loans and swaps DNB (Dutch National Bank) went from 31.572 million fine troy ounce in 1999 to 19.691 million in 2009, steadily declining each year. All data prior to 1999 has been removed from its site. Trichet's comments are not reassuring nor is his action on the collateral side. If it would, it would mean more QE. QE is probably the thing that will end it. Has anyone else here pondered why the US Mint started using London Fix pricing to set prices of gold and platinum coins(since Jan '09)? I wonder why they wouldn't just use COMEX pricing? And since London Fix is good enough for gold and platinum, why didn't they choose to use it for silver? I know why they changed their pricing methodology after the volatility of prices in '08 but just wondered why they chose London as the benchmark price instead of New York pricing. From where I can see it that zerohedge article is quite over the top. Meaning the BIS would take it temporarily in order to help England driving down the POG without really loosing the gold? Agree nwith your (and other) suspicion that the GErmans have a plan. FOFOA, a year or so ago you posted a video clip of a group being given access to the oval office meeting. IN it Summers is seen jovial until a phone cal comes and he is told they have a problem with the GGermans at which point the filming ends. I too suspect there is a lot more to the German point of view. New "The Committee will continue to monitor the economic outlook and financial developments and will employ its policy tools as necessary to promote economic recovery and price stability"
"In order to promote a smooth transition in markets, the Committee is gradually slowing the pace of these purchases, and it anticipates that these transactions will be executed by the end of the first quarter. The Committee will continue to evaluate its purchases of securities in light of the evolving economic outlook and conditions in financial markets"
Btw does anyone know a place where Ender posts regularly? I wonder what he has to say about the current state of affairs. I see the difference between those statements. Yes, continued used of those instruments signals more printing. 1. note the brits expelling the mossad rep in London - rumored to be at request of Americans. TRhen the Netanyahu meeting blow apart in DC. Is this a fissure or a psuedo fissure as cover for Israel "breaking away" on Iran? By extension if the ECB is seen to relax its' collateral rules anyone (IMF?) contributing to a bailout would be expected to accept the same collateral, would they not? A later conversion of some of this collateral to Euro would then be possible for the ECB while the US$ sponsors would not have access to this option without purchasing Euro on market. This could be seen in hindsight as a clever trap by cynical minds. According to *Jason Hommel's figures the USA is by far the largest retail investment silver market in the world. Perhaps the US Mint expects US demand to set the price for physical silver for the foreseeable future. I suppose, conversely, this change might imply that the US Mint doesn't expect the price of gold or platinum to be set in NY for much longer or that London pricing might be a better reflection of reality in pricing gold and platinum. Do you think London is now looking in a different direction for its lead in pricing these PMs? I disregarded his bias against the Euro and focused more on why he thought the US would be next. It's interesting how similar his path for the dollar is to what is being discussed here. ...the US dollar would benefit short term because it is the "anti-Euro". However, this situation has a strong potential to reverse rather quickly with US bond market and US equities falling in tandem. Lacking a backup plan, the Fed would launch QE to infinity. Conclusion: Own gold until governments get their affairs in order. If a high dollar does hurt the US bond market and exports it must lead to QE. If B raises interest to make bonds more attractive the dollar will go even higher, which would not be an option. The dollar has to go lower. So either more printing or more focus on domestic problems. Both are quite a dangerous instrument for B. Born in Augusta, Georgia, Bernanke was raised in a ranch-style house on East Jefferson Street in Dillon, South Carolina. "Do you think London is now looking in a different direction for its lead in pricing these PMs?" I really don't know what to think. But for a US agency to rely on Europe for this just isn't very American. lol I, too, was wondering if maybe someone at the mint expected a disruption of COMEX gold at some point. But if that happened, it seems like coin production would be temporarily halted no matter where price discovery originated. The plan must be for what happens on the other side of a COMEX disruption, after gold sales resume. I wonder if they expect the COMEX gold trading to be defunct by then? *gasp* If so, silver would surely be affected too. I know that's quite a lot to extrapolate from something so seemingly innocuous. Surely there's a more rational explanation. I just want to say 'Thank You' to everyone that contributes to this fantastic discussion! I'm having a little problem understanding some dynamics from your post. Lets say we are there, 50,000 euros per ounce. Now you say they will sell gold to strengthen the euro. So they reduce the reserves of their most valuable backing, gold, and their currency is thus stronger? By that logic if they sold it all, the euro would be at its strongest level. Would you help me understand please? Hello my old pal The MF! They only need to sell a very small amount in a single transaction, to mark a new observed lower euro-price in the market. They don't have to sell the whole reserve! If they want to take it down significantly, below the prevailing bid price I mean, yes they would need to sell more than that of course, in a series of transactions as the bid/offer prices naturally step down and down, towards their target. They can also take more euros out from the system than it would have taken to buy that gold just sold. By combining the both of the above, at just the right time, they would be able to write in their quarterly marked-to-market report, (1) that lower euro gold price observed in the market, and (2) a more favourable reserves-to-liabilities ratio (how many euro issued per ounce of gold in reserves - there are two sides of the balance sheet in their quarterly report after all). This combination would clearly demonstrate to all the world the strength of this currency, in terms of the golden barometer. And of course, not to forget that once the purpose has been served, it would also be possible to issue more digital currency and buy all the gold you want at market again to back them as well. It seems to me that the ECB can make their currency worth whatever suits their purposes (tracking stable consumer prices over the medium term), whenever it suits them.